On Sunday 22 June 1998 Fremantle defeated Carlton 10.16.76 to 10.8.68. Stephen O’Reilly, Chris Bond and Glenn Manton played well, Docker captain, Peter Mann who kicked a team lifting goal from a tight angle but, at the time, it was an unremarkable match. 103 home and away rounds later, it took on a special significance for one of the participants. For field umpire Scott McLaren (left) it was the first game in a record breaking 177 consecutive game streak. McLaren, Brett Allen, Brett Rosebury, Ray Chamberlain, Stephen McBurney and Jack Elder are the only umpires to ever officiate in more than 100 consecutive home and away matches and only 11 other umpires have compiled more than 60 matches in a row at the highest level. Football has changed much since Elder’s time. Field umpires no longer have to run the ball back to the middle after goals and now there are three of them to administer a game which is rarely mired in mud. Football today moves at a tempo undreamed of prior to the Great War. Since the beginning of the VFL, form, injuries and selection policy have contributed to umpires’ inability to stretch sequences to substantial lengths. Field umpires have had the greatest opportunities for long runs without a break. At some stage, usually at the height of their careers, the league’s best have managed to show form so good that did not warrant a visit to the country for a long time. In most cases they were also very successful during the finals series of the same period. Elder’s consecutive run is more remarkable than most. The first match was Geelong v. St.Kilda at Corio Oval on 5 June 1909. Elder was appointed for the next 102 home and away rounds which was remarkable enough but there was more. During this sequence Elder also umpired every final played (19), two matches in the split rounds 9 and 15 1909 and two matches in split round 15 1910. A total of 124 matches in 121 consecutive weeks of league football! He is also the only umpire to have continued a long sequence by umpiring in a different category. The third game of the record sequence (R8 1909) was umpired on the boundary. As a result, the record for a single category was 99 matches as a field umpire until surpassed by McLaren. Quite different in terms of finals success was Bob Nunn’s string of matches from round 16 1957 to round 8 1962. Nunn officiated in his only finals appointment, the 1962 Second Semi-final, well afterwards. He had been unable to break into the finals panel ahead of such luminaries as Allan Nash, Bill Barbour, Frank Schwab and Jack Irving. Until very recent seasons, VFL/AFL boundary and goal umpires have never had the opportunity to compile more than five or six games in a row. Selection policy between 1897 and 2000 shared matches between the members of the respective lists. During the 1950s, 1960s and 1970s the roster was formalised to such an extent that umpires knew that they would be umpiring three weeks in four, with the last week having no football commitments. In season 2001 the AFL issued a directive that boundary and goal umpires be appointed on the basis their assessment rankings only. Effectively, it meant that the highest ranked umpires had the chance to umpire every week for the first time in VFL/AFL history. This was particularly the case in Victoria where, with the larger list and more matches the directive was more closely followed. Prior to this directive though, boundary umpire Chris Macdonald did manage a 31 match run from 1995 to 1997 that included five separate rounds in which he umpired two matches – an unprecedented achievement. Boundary umpire streaks from 2008-2011 have coincided with the introduction of the four-boundary umpire system and led to the three longest streaks being accumulated by John Morris (65), Gerard Large (64) and Mark Foster (62). Another remarkable achievement was Chris Gordon’s run of 59 which were the first 59 matches of his career. Goal umpire Craig Clark added yet another laurel to his career. 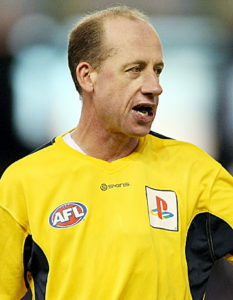 No other goal umpire has managed to umpire more than 50 consecutive AFL matches. Clark’s run ended after 54. David Dixon just missed reaching fifty when he was named to the bench after 49 consecutive AFL matches.